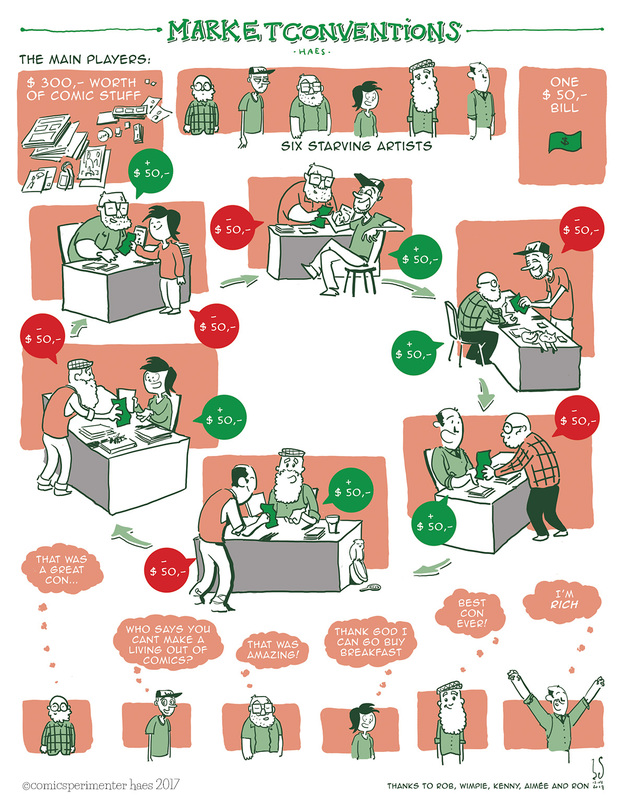 This comic is a visual representation of the independent comic book artist’s economy. Besides loving to experiment with comics, I’m a real sucker for the business side of things. Making art and trying to make a living out of it isn’t easy in any art form and comics are no exception. Also, the independent-comic-book-creator-market is quite crowded with creators. Lots of people love making comics and would love to make a living out of it. However a healthy market obviously should also have a large customer group. And that’s exactly where I think the comic book market is out of balance. For every six creators, there’s maybe one buying customer. And most of the time he is only slightly interested. Obviously this makes it very hard for comic book creators to make a living, or actually any money at all, with their work. Which makes sense, if you make comics yourself, you probably are excited about comics. And knowing what it’s like to have no one to buy your work, you probably feel sorry for other comic book artists, so… you buy their stuff. This leads to a silly micro-market-situation in which comic book artists are buying from each other. Fooling themselves into thinking there is actual money in this. When you do what you love (making comics) it’s always hard to see the downside of things, but I think sometimes it is important to face reality. From a business perspective the comic book market is just extremely crowded and the demand is very small. All of this already was lingering in my mind, but it clicked after hearing a (one of many) podcast by Chris Oatly of Oatley Acedemy. Talk about your wake up call! I thought it would be a nice experiment to try and capture this in an infographic like comic. Obviously this paints a very bleak image of the state (independent) comic book creators are in right now. Does that mean all is lost? Should we stop making comics altogether? Comics has always been a medium that prevailed despite huge odds stacked against it. And art in general should not be motivated by market research alone, I think. Current times come with as many thrilling possibilities (being able to talk about this stuff online being only one of them) as it does with difficulties. In the best case scenario comic book artists are motivated by this insight, instead of being discouraged by it. Looking for new ways to break out of the confined market space we are in right now. However, some realism about what to (economically) expect, is never a bad thing. When planning this thing, I soon realized I needed to draw a couple of ‘typical comic book artists’. So I though, I might as well base them on same real life artists I met at conventions. Ironically enough these are all people who managed to break out of the confined market space in their own way. Which is quite hopeful. I tried to draw each of them in their own specific style, which is always a fun exercise. When I asked each of them if I could include them in this comic, all of them said yes. Which is awesome! Since I live in Holland, there are all Dutch comic book creators. Check out their stuff (use Google Translate if you must). Wimpie is one of those silly cartoonists with an amazing gift for absurdity. His animal strips featuring Sperm Whales and Toucans are completely out there. He recently released ‘Recht uit de ondergrond’. Check out Wimpie on Instagram! The first thing I saw from Rob were a bunch of hilarious nonsense comics containing ‘advice that won’t get you anywhere’. But recently he is making cat-centric stuff. Talk about ‘finding your niche’. Check out Rob on Instagram! In his Bukowskesque graphic novel ‘Tussen Katers en Spraakwater’ Ron captures the (un)coming of age of a bunch of guys from Rotterdam quite well. It’s a great read for students out there trying to finish their thesis. Currently Ron is working on an adaptation of the famous Dutch hero Tijl Uilenspiegel. Check out Ron’s stuff on Instagram! Aimeé has to be one of Hollands most famous comic book creators. Besides crushing it with a daily (!) gag comic in newspaper Metro, she manages to work on graphic novels that get adapted into movies and that kind of stuff (most recently ‘De wraak van de wespendief’). Don’t tell me that’s not impressive! Check out Aimeé on Instagram! Kenny single handedly created the comic book brand of a new generation. If you’re at a convention and you see a long line, it’s probably fans waiting for Kenny to sign. ‘Dating for Geeks’ taps into geek culture quite brilliantly while still being interesting for a (large) mainstream audience. The comic appears as a daily and has a huge online following. Check out Kenny’s Dating for Geeks on facebook! A Dutch version of this comic was featured in the Dutch magazing Stripglossy. Click here to read the comic in Dutch. Are you (not) buying comics?